In April 2000, my mother, then age 49, was diagnosed with Stage IV metastatic breast cancer. That means that the cancer had spread out of her breast and begun to grow in her bones, specifically in her spine. Shortly before diagnosis, she suffered a stress fracture of one of her vertebrae. It was painful for several days but did not cause any lasting damage. In June 2002, after the cancer had spread to her liver, she had a liver resection surgery. More than 70% of her liver was removed at one time, and she spent 11 days in the hospital. She went home and recovered for eight weeks before she returned to her normal self. 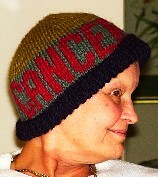 In July 2003, her cancer counts were down and her blood counts were up. Everything was looking great. But in October, things turned down again. I didn't know it then, but they would never look up again. The story that I tell here technically begins in October 2003 and ends on February 13, 2004. But that's not the way life works. There's more to say, and if truth be told, this blog is about me more than it's about my mother. She starred in it, and she's still making cameo appearances. Back in October, I made a hat. It's partly for her and mostly for me. She borrowed it for several months, and I have it back to remind me of my love for her. 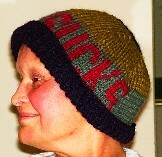 Mom loved the hat, and she loved its message. I love it because it reminds me to use my anger productively. I was looking for your e-mail or contact info on the website, but could not find it. So, I will leave this message here with you, but please feel free to contact me directly. I really appreciate your blog and your writings on this significant topic. It is one that many women will identify with--myself included as my mom died due to cancer in 2002. Soliciting short stories for a book by women, for women on life transitions and significant turning points in their lives. Everyone has a story to tell about a time when they were at a crossroads or standing at the threshold of a life changing event. These days have been especially trying for many people facing significant life situations and decisions. I am collecting short essays from women for a book by women, for women on life transitions and significant turning points in their lives. If you have a story to share, I would like to hear from you. This upcoming book will be a collection of true, short essays with a focus on the turning points in women’s lives or times when they found themselves on the cusp of a major decision or life changing event. Women are invited to share the stories of their personal struggles, difficult decisions, triumphs, heartbreaking losses, moments of pure joy, and times of confusion and doubt in their lives. This book will shine a light on the difficult choices and provocative moments women face in their lives and how theycarry on. As the lead author, I intend to blend the stories and experiences into a shared connection that all women will identify on their own life’s journey. For more information about contributing your story, please go to: www.ReflectionsFromWomen.com. Deadline for consideration is March 1, 2009. Thank you for the opportunity to share this announcement with you. I love, love love, love LOVE that hat. And you. And I'm sorry. I obviously never met your mom but she had to be someone pretty awesome to produce the daughter and grandkids she did.